“Chiang Rai (เชียงราย)” might be less well known than Chiang Mai as a tourist destination. After my visit to Chiang Rai in February 2015 I found that Chiang Rai was actually much fascinating with less tourists than Chiang Mai. 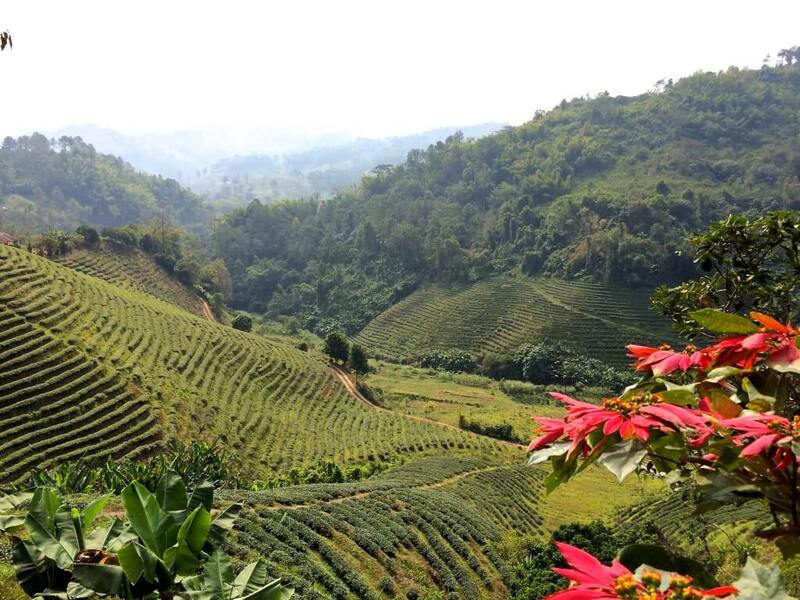 Chiang Rai is endowed with an abundance of natural beauty and cultural heritage that attracts visitors year round. Chiang Rai was founded by King Meng Rai in 1262, and was the fist capital of the Lanna Thai Kingdom before it moved to Chaing Mai. It became a territory of Siam in 1786, was annexed in 1899, and formally became a province in 1933. 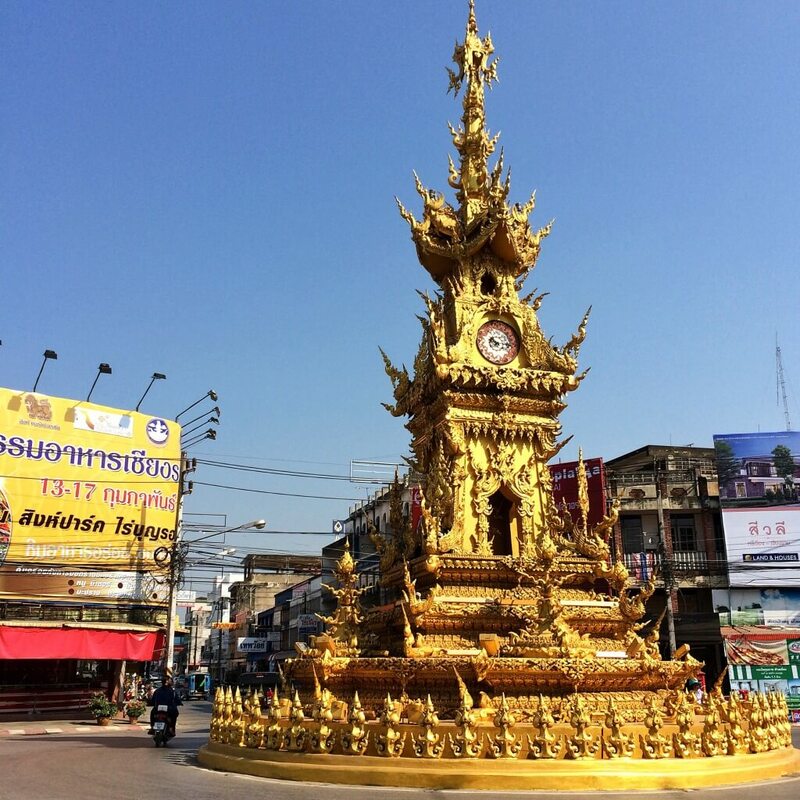 I took an early flight from Don Muang International Airport in Bangkok to Chiang Rai which took only one hour and ten minutes. Once I landed the rental car I hired via a website was delivered right in front of the gate of the arrival terminal in the Chiang Rai International Airport. There was no hassle at all, I only paid a cash deposit and gave a copy of my passport then I just drive away. 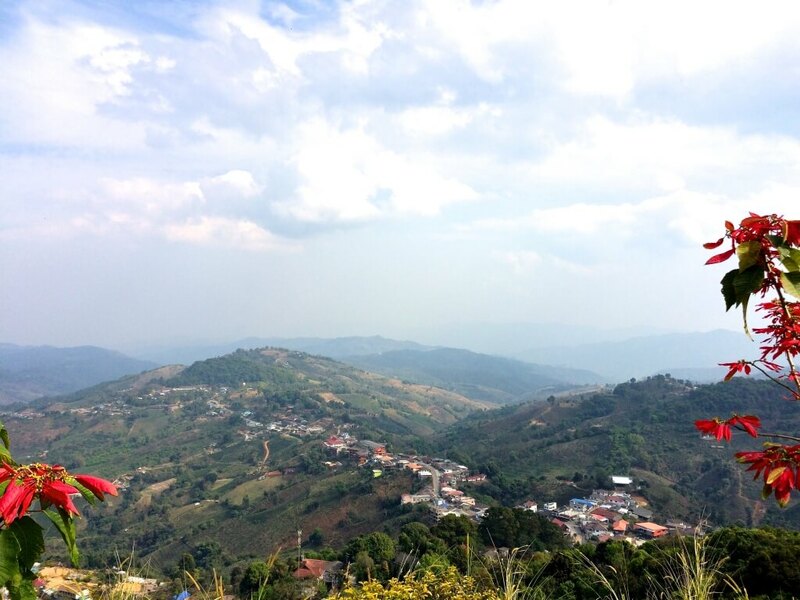 I immediately headed to my first destination with the help of Google Map “Doi Mae Salong ดอยแม่สลอง“. Doi Mae Salong is one of Chiang Rai’s top attractions, also known as “little China on the mountain”. It is well wroth dizzying drive 80 kilometres northeast of the city, rising to a cool attitude of 1,800 meters. When communism was established in China in 1949, the Kuomintang southern remnants of the National China Army, fled into Burma (Myanmar) and survived by growing opium. The Burmese army pushed them into Thailand in 1961. Somehow, they established themselves on this mountain and were welcomed by the resolutely anti-communist Thais. They brought their own language and their style of building. Roofs with upturned corners can even be seen on brand new homes. The struggles of the original settlers ended as recently as the 1980’s and the straggling, switchback little town of some 20,000 inhabitants has been named “Santikiri สันติคีรี” which means “hill of peace”. 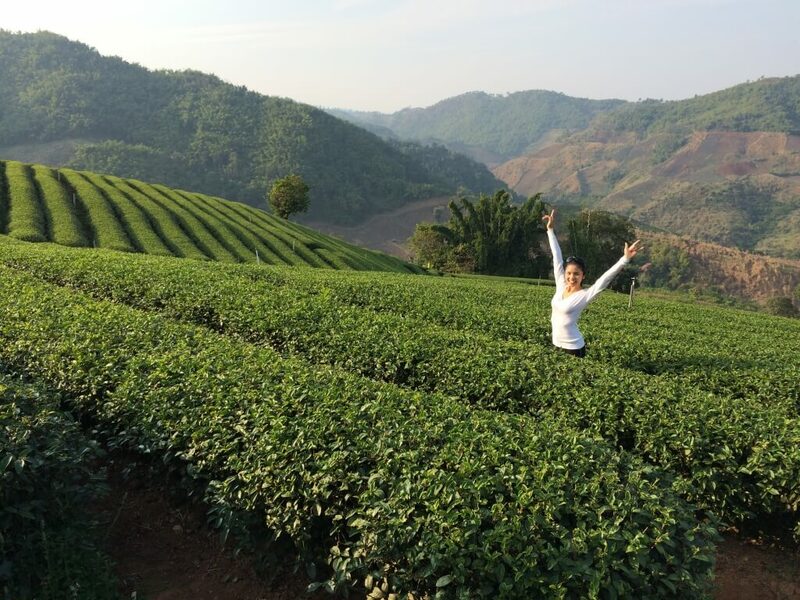 Santikhiri village is noted for its high mountain oolong, a high grade traditional Chinese tea, which makes up about 80% of all tea production in Chiang Rai. 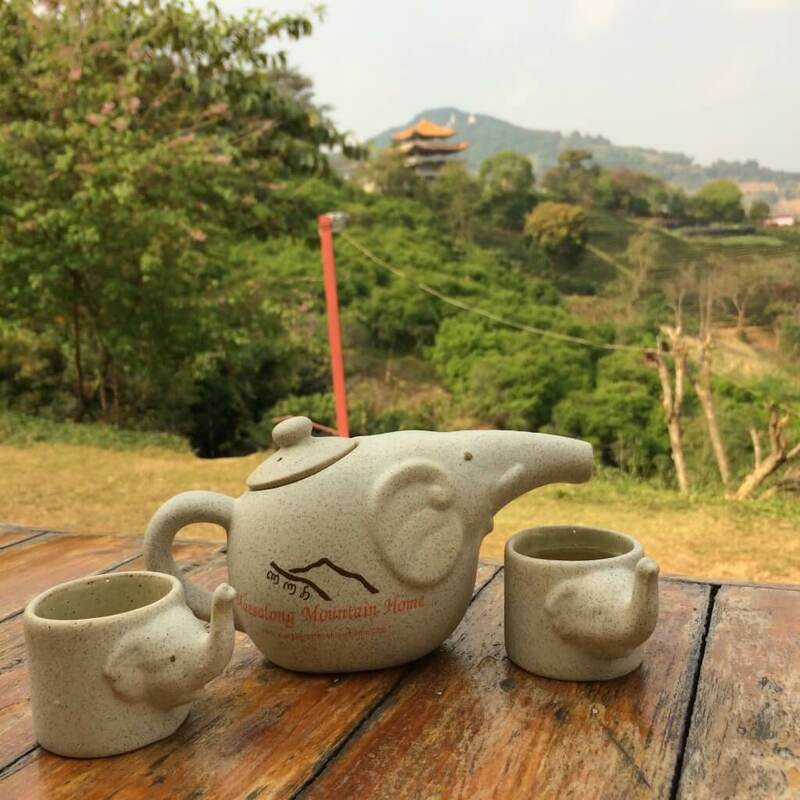 Near the peak of the mountain visitors will find several tea plantations as well as tea houses. The mountain is particularly busy from November through February, when temperatures drop below 20 degrees and tourists from the rest of Thailand flock here for a touch of cold weather. Tea tasting is another Mae Salong “must”. I love this small cafe called Sweet MaeSalong, it is located on a hill facing pretty view of the mountains. I ordered a small jus of Oolong tea to pair with my Raspberry Bomb cake, it was so nice! Uhmm… I really miss that moment. After enjoying my tea and a walk around the local market, I drove up to the highest point of the mountain to visit Phra Boromathat Chedi, it is a chedi built on a hill 4 kilometres away from the village, in honour of the late Princess Mother, Srinagarindra. There is an excellent view of the Myanmar frontier from the top, an area that was off-limits when it was under the control of the warlord Khun Sa. After a full day of exploring Doi Mae Salong, I headed back to the resort I already checked in when I first arrived. It is a lovely family-run resort surrounded by beautiful gardens and mountain views. One memorable thing for me was when I woke up in the morning and walked out to the balcony to enjoy the view, the only sound I heard was bird singings, no cars, no unpleasant noise, no pollution only fresh and clean air. It was wonderful! Some more Oolong tea to warm myself up. It was 18 degree Celsius…I know it wasn’t cool for you but it was totally chilly for me. 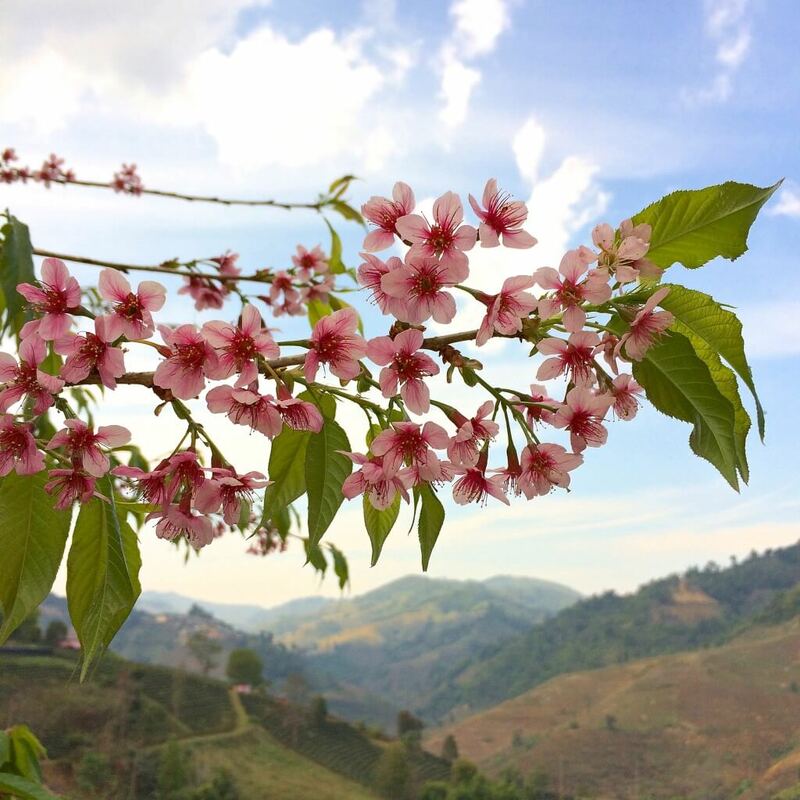 Every year from 28 December to 2 January, Santikhiri village hosts the annual cherry blossoms festival, which is organised by Mae Salong Nok Tambon Administration Organisation in association with Mae Fa Luang District. The festival celebrates the culture of the hill tribe people from the Chiang Rai area, and includes a handicraft sale, a light and sound show, a parade by the tribes people, and a beauty contest. I made my trip in February so most of cherry blossoms were already fall off, but I was lucky enough to see a couple of trees with full bloom cherry blossoms. They were so delicate and lovely. I left Doi Mae Salong late after breakfast and slowly drove to my next destination “Doi Tung ดอยตุง” which took about 1.5 hours. Mae Fah Luang garden is an award-winning garden, acclaimed the most beautiful temperate flower and plant garden in Thailand. The gardens are located on land that was originally the Akha village of Pa Kluay. 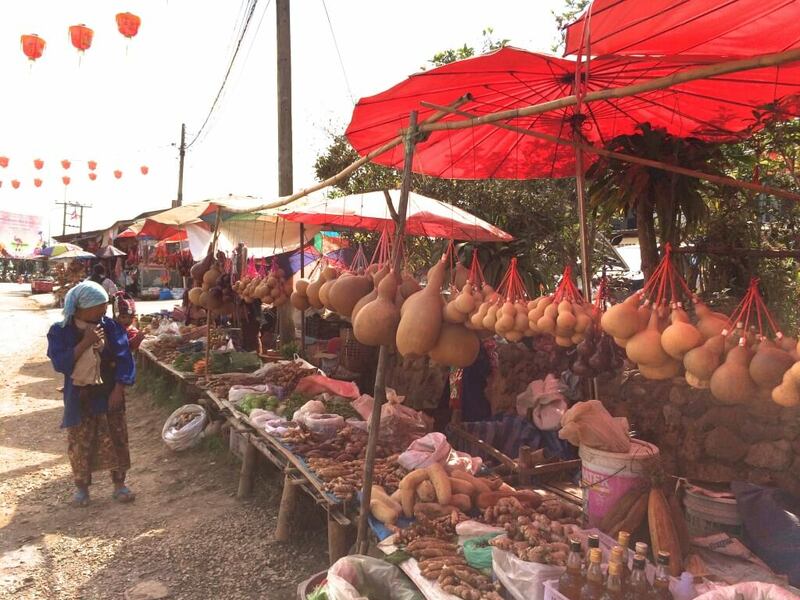 This village used to be an important route for opium caravans and those involved in heroin-related weapon trafficking until it was resettled by the Doi Tung Development Project of the Mae Fah Luang Foundation. 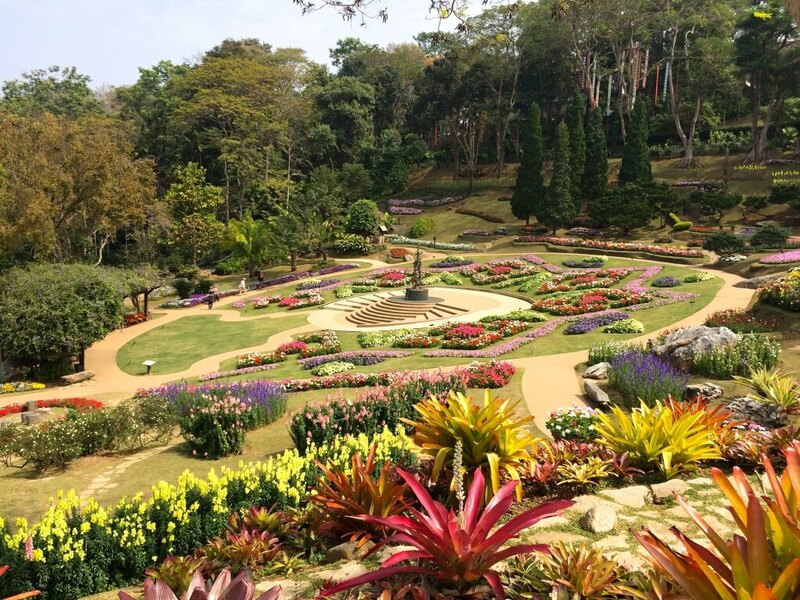 A garden of mostly temperate flowers was built over 10 acres of land in accordance with the Princess Mother’s wishes to give Thai people who have never travelled overseas an opportunity to enjoy a temperate flower garden. 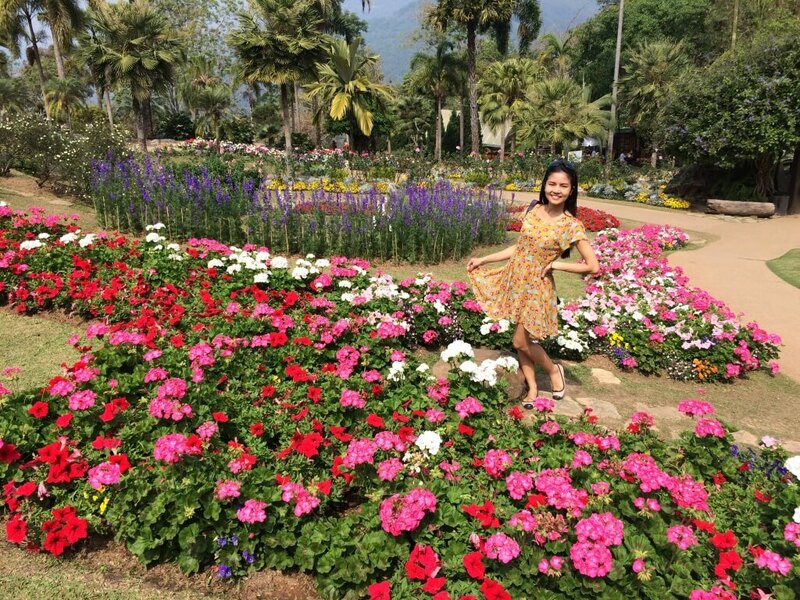 The flowers in Mae Fah Luang Garden are grown and nurtured by local villagers. 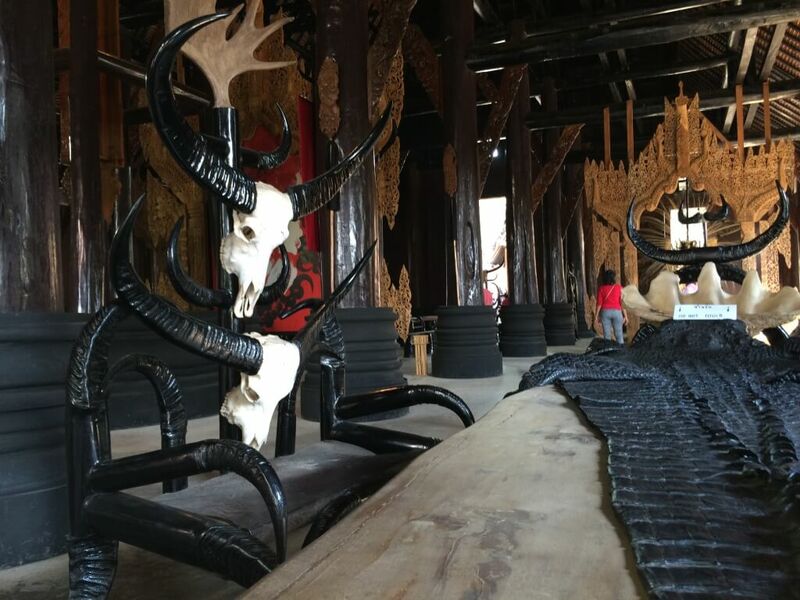 The landscape designer, Pravit Boonmee, has been untiringly devoting his talents and experience for 17 years since the beginning of the development of this garden. He is still facing with the constant challenge of how to keep the garden in full bloom all year round. Among his unique creations are the special colour schemes for the different days of birth of the royal family such as red for the Princess Mother who was born on a Sunday, and yellow for His Majesty the King who was born on a Monday. In the middle of this garden stands “Continuity”, a sculpture by the late Misiem Yipintsoi. The princess mother gave this name to the sculpture to draw attention to the fact that continuity ensures the success of any endeavour. 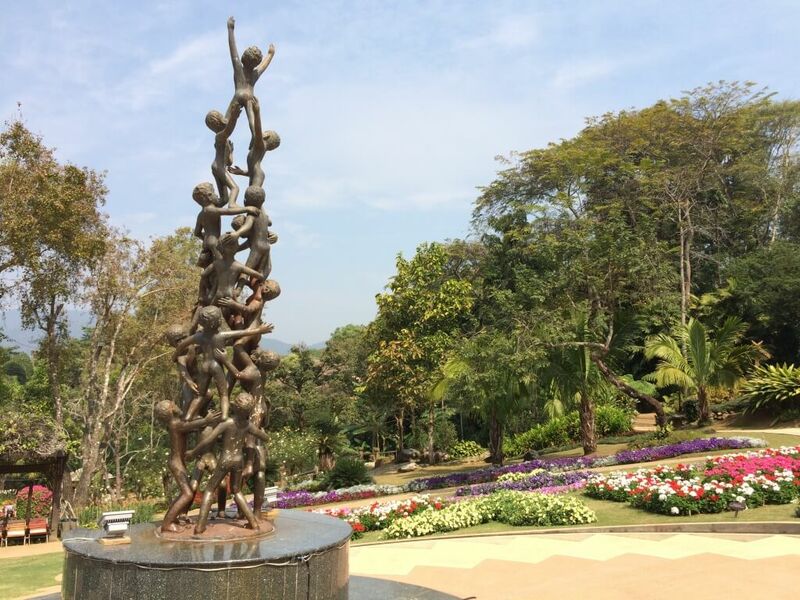 From Mae Fah Lunag Garden, you can continue further to visit Doi Tung Royal Villa which was built with Princess Mother’s private funds; she considered it her first real home in Thailand. The Princess Mother also made it known that without the Doi Tung Development Project, she would not have built a house in the area. She only stayed because she could reforest the land and helped to improve the lives of the local people. There are accommodations in Doi Tung if you wish to stay. I have been there with my family before a few years ago, so I decided to head down to the city center. On my way to town, I made a quick stop at Choui Fong tea planation as I heard that they serve delicious tea desserts. 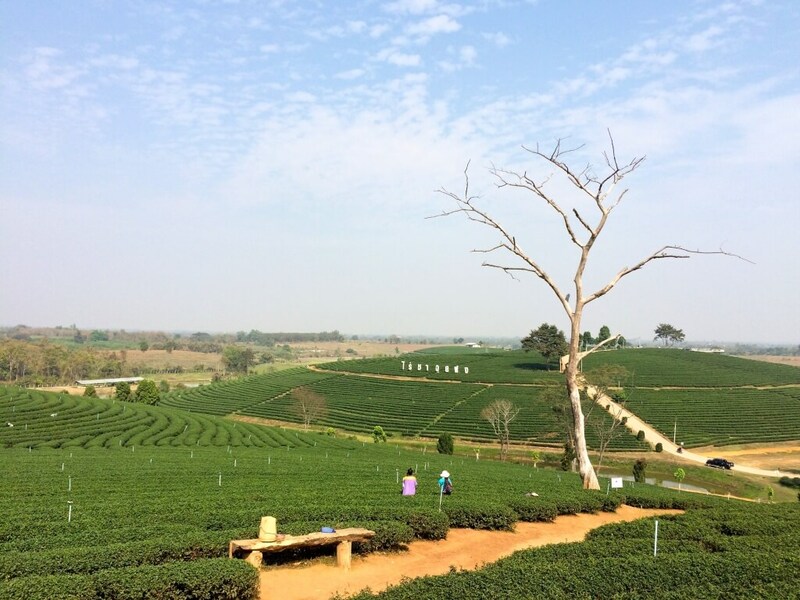 This place is very large (1,000 rai) full of well grounded tea plantation. You can drive up to look at the views, sample a few teas, buy a tea drink or some loose teas to take home. 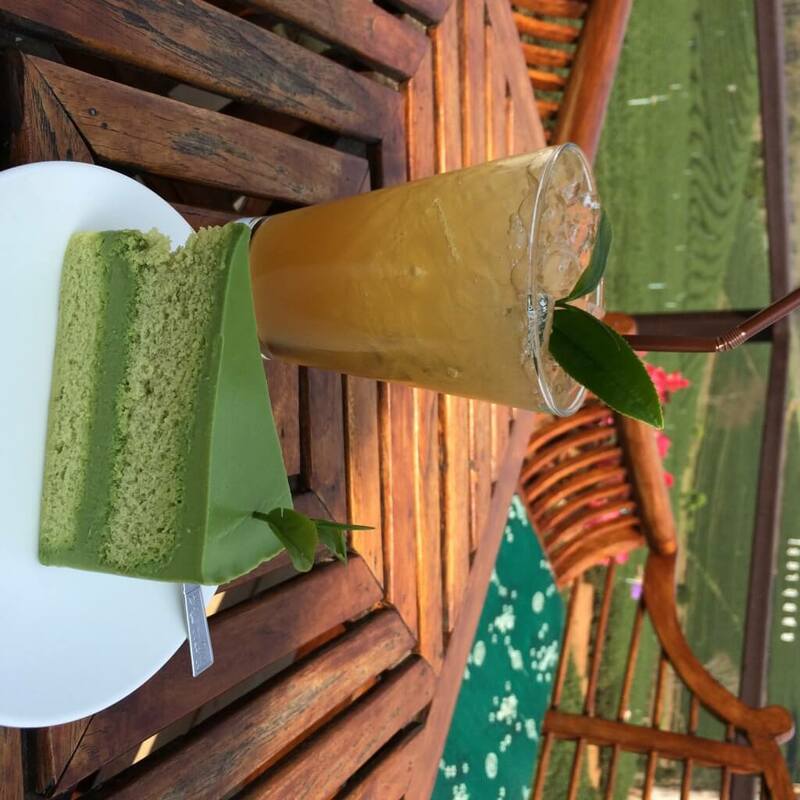 Delicious green tea cake and iced tea at a cafe in Choui Fong tea planation. 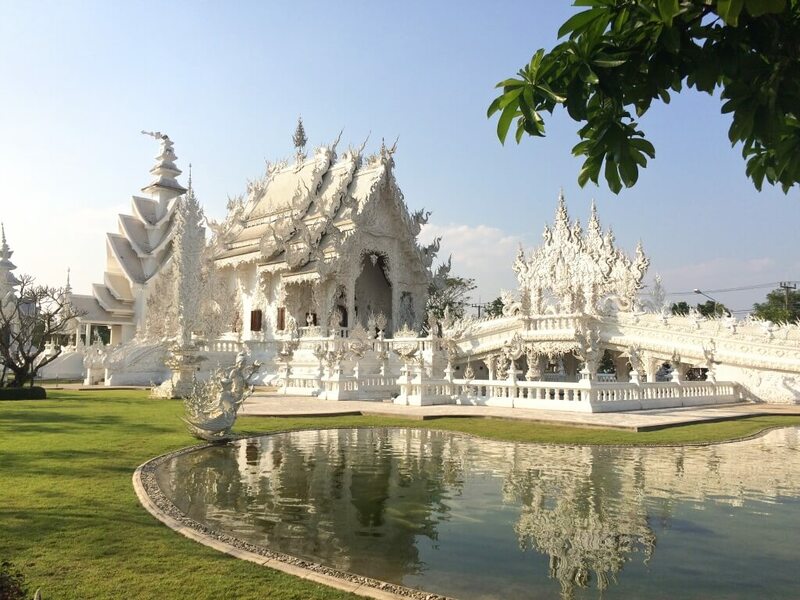 I had to admit that before I went to Chaing Rai , the only tourist attraction I knew was “Wat Rong Khun วัดร่องขุ่น” or the White temple. How to say it was 18°c ? Is there a classificator for degrees? Thailand is my third home, have travelled all over and love its diversity and warmness. Beautiful pictures. What a gorgeous countryside. I never realized until now that Chang Rai would be a great weekend trip. 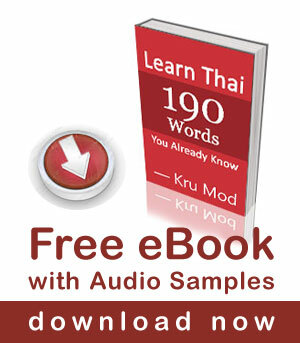 Thanks for sharing this and, of course, helping me to learn Thai. Thank you for your comment. I actually haven’t finished writing this article but accidentally published it. I will complete it soon. 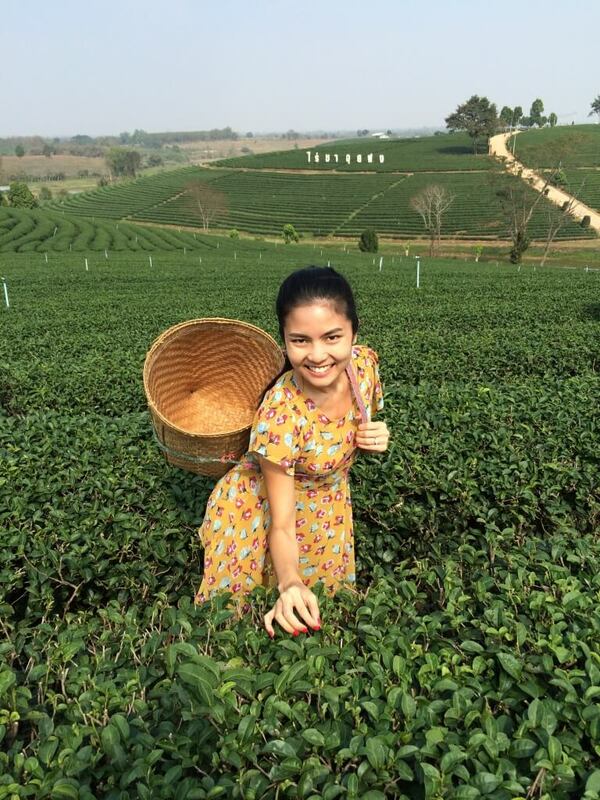 Chiang Rai is definitely a wonderful place to visit. 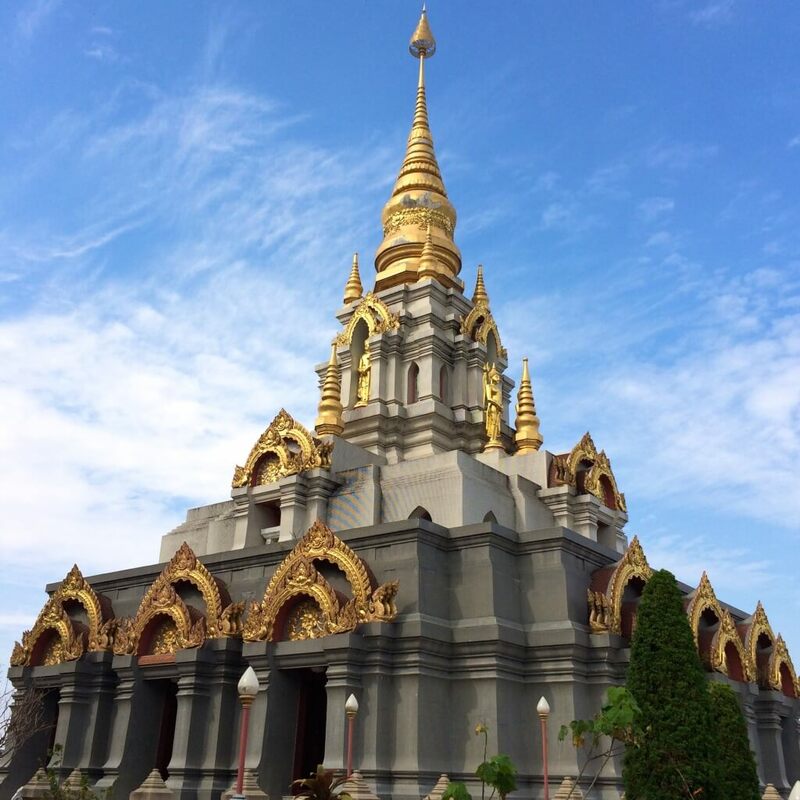 We visited Chiang Rai in October 2015 (we had someone drive us from Chiang Mai where we were staying). I see from yoru post that we missed so much. We only saw Wat Rong Khun. Next time we will visit all of these places we missed! 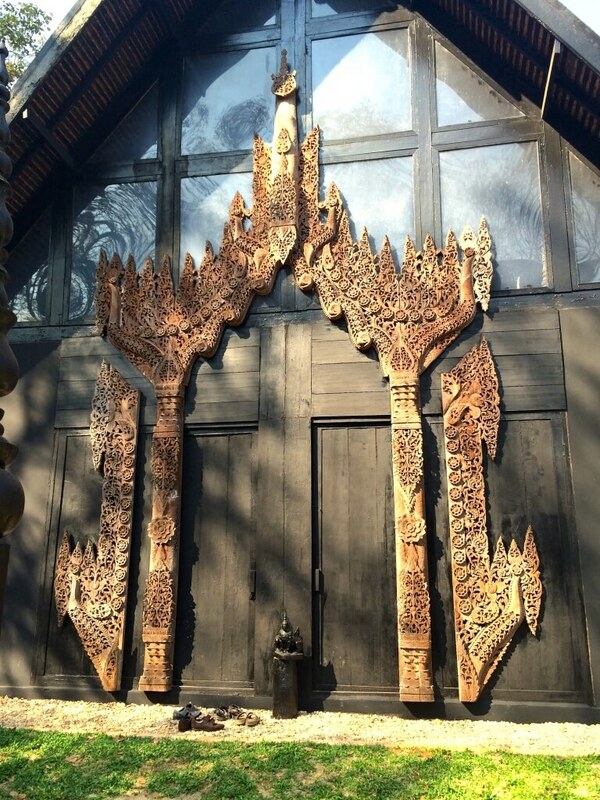 I visited The Golden Triangle last week and half way on Chiang Mai / Chiang Rai highway 1, my first rest stop was at the official Doi Chaang coffee house for its incredible coffee. 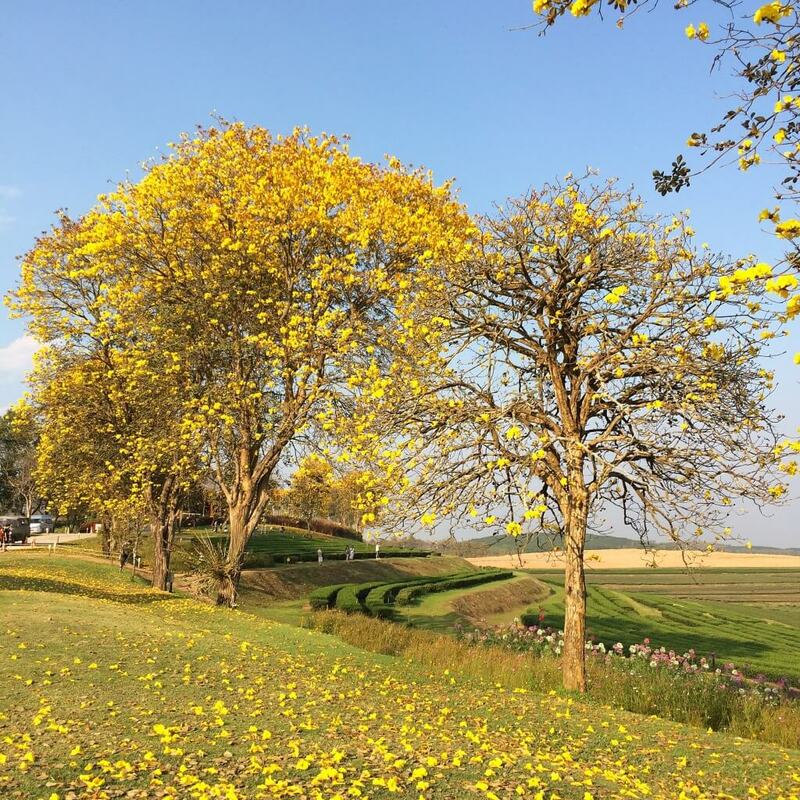 Spend a night at Doi Mae Salong which is an atmospheric village perched on the mountains bordering Chiang Rai and Myanmar at the elevation of above 5900 feet above sea level and take a long and winding road down the following day to Tachaileik. Thank you for your comment. It sounds like you had a good trip. I wanted to visit Chiang Rai again last month, but unfortunately didn’t have a chance. Hello. I am VERY IMPRESSED.